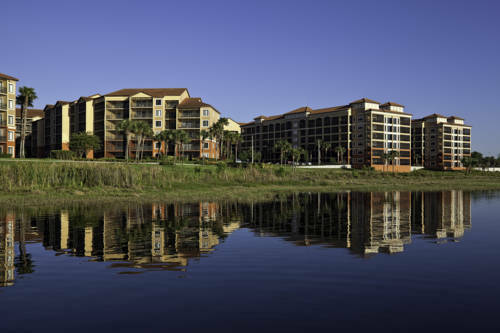 Westgate Lakes Resort and Spa is a lakeside all Villa- pet and family friendly- resort located in the heart of Orlando within minutes to all major attractions- shopping and restaurants. Fully furnished Studios to Four Bedroom Villas provide all the comforts of home with amenities like kitchens- living rooms- washers- dryers and balconies. Guests can enjoy Wi-Fi- Serenity Spa- Smokehouse Grill Restaurant- Sids Bistro for Starbucks coffee and Hersheys Ice Cream- Cordovano Joes Pizza- Marketplace and Deli- Poolside bars- extensive Fitness Center with classes- Activities Center- Business Center- 7 pools and hot tubs- Bicycle rentals- Sports Courts- Sand Volleyball- Playground- Mini Golf- Fishing and paddle boats at the marina- and more including ChargePro EV charging stations. Plus get free shuttle service to Disney- Universal- SeaWorld and the Premium Outlets for shopping. Attractions Ticket Desk located in lobby. There is truly something for everyone. Located within a 6mile radius of all major Orlando attractions. The beautiful lakefront Westgate Lakes Resort and Spa is a tropical paradise that lies within 2 miles from SeaWorld Orlando and Universal Orlando- and only 6 miles from Walt Disney World Resort. In addition- Westgate Lakes provides convenient access to the Orange County Convention Center- Downtown Orlando and the Orlando International Airport as well as the new Orlando Eye complex. Serves breakfast and dinner daily-kids menu-game room-full bar-televisions. Fresh New York style pizza delivered to your room or poolside- or may be picked up. Serves lunch and dinner.